178 C A R M E L M A G A Z I N E • W I N T E R 2 0 1 8 The 25th annual Comics for Kids fundraiser at The Inn at Spanish Bay in Pebble Beach, which takes place on March 17, is hosted this year by award-winning actor, writer, producer and comedian Anthony Anderson of the ABC hit show "Black-ish." "Anthony Anderson is a Club kid and a National Hall of Fame member," Jackson says. "We are so excited to have him representing our audiences." Carmel Magazine spoke with Anderson a few months before the event, which organizers hope will raise $1 million for youth services. Carmel Magazine: You're headlining the 2018 Comics for Kids Event in Pebble Beach to benefit the Boys & Girls Clubs of Monterey County. What is your personal connection with the organization? How important do you feel it is for after-school and summer programs to fill in the gaps between school and home? What are the specific needs you feel we, as a culture, need to be aware of to support our children? How are we doing? What needs to improve? Anthony Anderson: My personal connection to the Boys and Girls Clubs is that I was Club kid at the Watts/Willowbrook Boys and Girls Club. I was also inducted into the Boys and Girls Clubs of America Hall of Fame this past year. Their after-school and summer programs are very important for numerous reasons, including a lot of children are latchkey kids, myself included when I was a child. That being said, the program not only serves as a safe haven from predators, gang violence and drugs but most of all is a place where kids can feel safe. They feel protected in a place where they are cared for. It also is a place that Club kids can express themselves and are free to dream. A place where education is paramount and their well-being always come first. We need to listen to our children. If we only took the time to listen to them and not be so fast to tell them what we need or want them to do, we as adults could learn a few things. There is no truer saying than "out of the mouths of babes…" Truth, honesty, hope, despair are things that we would hear. Things that we would be compelled to do something about if only we took the time to LISTEN! I think we're doing ok, but things can always get better. The improvement comes from us taking the time to stop and be present in the conversations that we are having with these children. CM: You walk a very successful line between drama and comedy on your hit ABC show "Black-ish." What has surprised you most about reac- tions from viewers to subjects that are typically not discussed on televi- sion? Are there any topics that you feel are too "hot" to touch on prime- time, or are we ready as a culture to be pushed? Are there any limits? AA: Nothing has really surprised me about the success of our show. Yara Shahidi plays Zoey Johnson, the oldest child of Andre and Dr. Rainbow Johnson on ABC's "Black-ish." 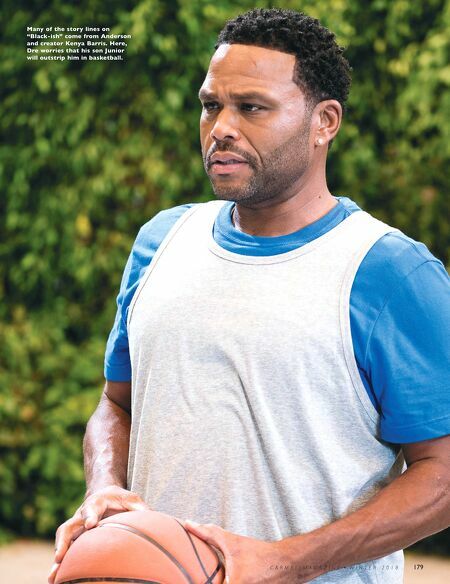 Anthony Anderson stars as Dre, an advertising executive struggling to keep his children's values intact in a privileged world. Photo: American Broadcasting Companies, Inc. All rights reserved.